Before high school, Stu finished 1st in the Ford sponsored Punt, Pass & Kick" competition from 1963 through 1967. Levenick lettered 3 years as an offensive lineman and defensive end for the Washington Panthers, gaining all-Corn Belt Conference honors as a senior. 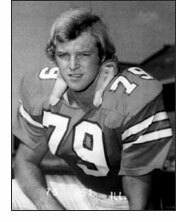 Enrolled at the U of I School of Engineering, Stu walked-on and made the football team as a freshman, playing tight end in five games - enough to letter. Awarded a full scholarship, he switched to offensive center as a sophomore and started 11 games. An injury as a junior saw him red-shirted. He finished his career with outstanding junior and senior seasons, gaining all-Big Ten honors, being named Illini MVP and finally, Honorable Mention All-American honors as a senior. He played in the East-West Shrine Game, the Hula Bowl and Japan Bowl. He was drafted in the 9th round of the 1976 NFL draft before a knee injury ended his playing career.